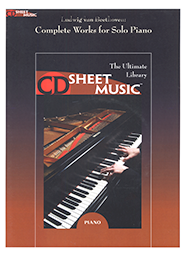 This CD contains the most comprehensive collection of its kind, with pieces from beginner to virtuoso. Included are virtually all of the important pre-1923 works of Alkan, Bizet. Chabrier, Chaminade, d'Indy, Dukas, Franck, Ibert, Koechlin, Massenet, Milhaud, Poulene, Ravel, Roussel, Saint-Saens, Satie, Schmitt and Vierne - over 2300 pages.